The restaurant chain’s new 53-foot truck is a virtual diner on wheels with a built-in kitchen. 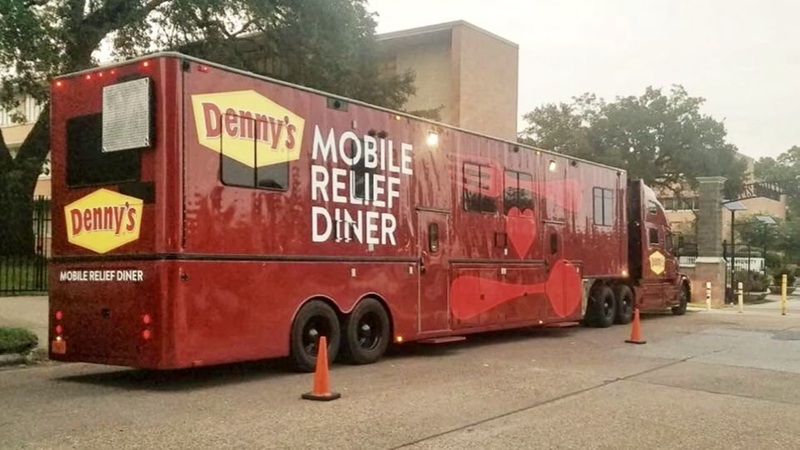 The mobile Denny’s is traveling to areas hit by fires, storms and so on, to serve free pancakes, bacon, coffee and other drinks to residents and first responders. The truck’s test run came in late August, when it went to Northern California to feed people affected by wildfires. Now, it’s heading to the Carolinas to feed people recovering from Hurricane Florence. It plans to begin with a stop in hard-hit Wilmington, North Carolina, on Sept. 21. Denny’s creative agency EP+Co is promoting the effort, which comes after Denny’s tried out a temporary mobile diner in 2017. After Hurricane Harvey in Texas and Hurricane Irma in Florida, Denny’s says it served more than 14,000 meals over two weeks.